It's the Cakeyboi 2013 Calendar Giveaway!! I have 3 wall calendars to give away to three lucky visitors. The calendar features a different Cakeyboi cartoon each month, some old favourites and some not yet seen on the blog. The giveaway runs until 24th December – Christmas Eve, so someone will get a great gift for the New Year (unless you live outside the UK and shipping may take longer!). If you would like a chance to win the one of the calendars, simply leave a comment on this post. 1. Follow Cakeyboi on Google Connect or Networked Blogs (down the side panel) and leave a second comment to say you have done so. 2. Follow @MrCakeyBoi on Twitter and leave a separate comment to let me know you have done so. 3. 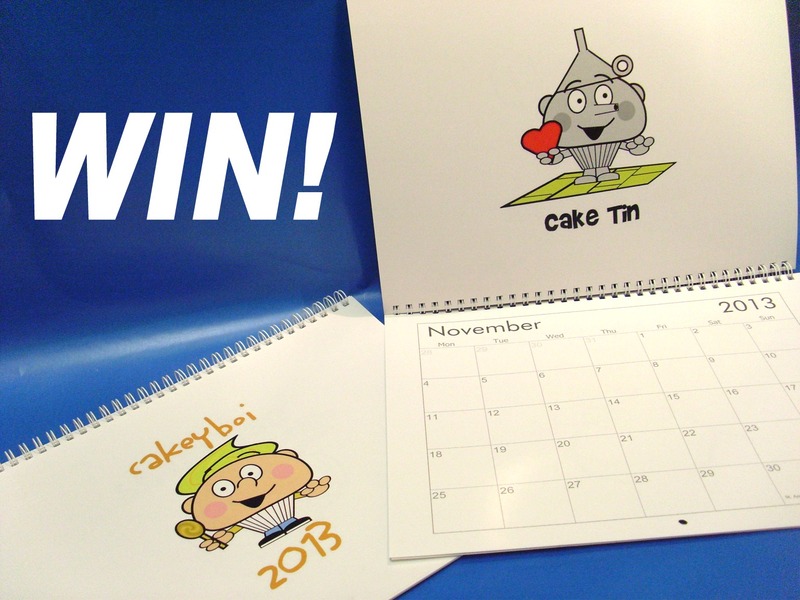 Tweet the competition using (I'd love to win a #Cakeyboi 2013 Calendar! #win #giveaway) and leave a separate comment to say you have done so. 4. Like the Cakeyboi Facebook Page and leave a separate comment to let me know you have done so. The giveaway runs until midnight on Monday 24 December 2012. I'll announce the winners soon after. This giveaway is open worldwide! Yes, it has been quiet on the cake club front recently. What with one thing and another I haven’t had the time to go along to the past two. But I made room in my calendar for this month's meeting. 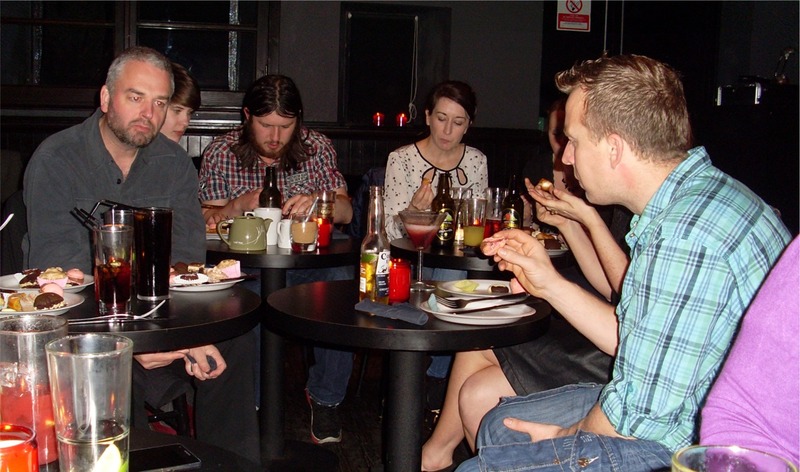 The theme was Petit Fours, which were right up Cakeyboi’s street. My recent bake of Pumpkin Cake Doughnuts was a perfect take-along (especially as host Becca from Becca Bakes specifically requested them!) and luckily I managed to find a few more tins of pumpkin (In TK Maxx of all places!!). The venue was Duke’s Corner in Brown Street, Dundee. It's a great pub, open til late with amazing food, host to lots of DJ's and gigs – I think The View started out there - and of course a great selection of drinks. We were given a cosy, shady area behind a dark curtain , which made the whole event seem even more surreptitious than usual!! The selection of bakes was, I can honestly say, my favourite since I started attending the cake club. There were chocolate and pomegranate petit fours, almond cupcakes with amaretto frosting, macarons with chocolate frosting, lemon and peppermint creams, peanut butter truffle brownies, salted caramel cupcakes, mocha cupcakes, chocolate and caramel mini éclairs, and more besides. Now, I have never tried macarons before, because I have never been a fan of almond flavour, but I am a convert. These are delicious. Made by our other host - Jac from Tinned Tomatoes blog - they were my favourites along with the salted caramel cupcakes. Disneyboi came along with me for the first time and he was stuffed to the gunnels and so was I, despite neither of us having dinner beforehand! A fab cake event as ever, great to meet new folk ( I even met an old Uni chum whom I hadn't seen for more years than I care to remember). I can’t wait for the next! Great post on the cake club, off to see if I can win your calendar! Adorable! I would love a calendar with so many little Cakeyboi cartoons! Thanks for the contest!